Some months ago I paid for a web site named “StoneSoupArtQuilts.com.” My most successful (to my eyes) quilts have always grown organically, rather than being designed all at once, pieces cut, sewn as designated. My quilts usually begin like the soup: nothing much to start with, but by the addition and assimilation of one bit and then another, quite satisfying. The piece for our “Gathering” challenge is one version of what can result from such an approach. As I said in an earlier post, the center of this piece, which I’m calling “Leaves, Gathering,” was spontaneous in its creation; I applied leftover paint, via various stamps, to a random piece of muslin, which, after heat-setting, I soaked in tea. This is not the only bit of accidental art I’ve saved, but so far it’s the only one to be put to use. It survived several purgings of stuff as we prepare to move so I decided that it could be the beginning of a “gathering” piece. I had also recently bought a yard of “Stonehenge” fabric and then made a 20”x20” sandwich. Clearly, this was meant to be. I basted the layers together and then started to stitch. I love to stitch – the feel of needle into and then out of fabric, the look of individual stitches as they emerge, the transformation of a flat surface into one that has tactile as well as visual texture. For this quilt, I knew I’d be using only stitch to embellish, as my surface design materials are already boxed up for moving. So stitch was going to be the whole story. First, I stitched the leaves’ veins with a rayon thread, hoping to bring the leaves to life. For quilting the Stonehenge fabric, I used variegated green/brown/blue 40-weight cotton. As the piece grew, I came to think of it as a snapshot of the sidewalk in front of our house when I was a kid in New York – the Queens borough of the city. 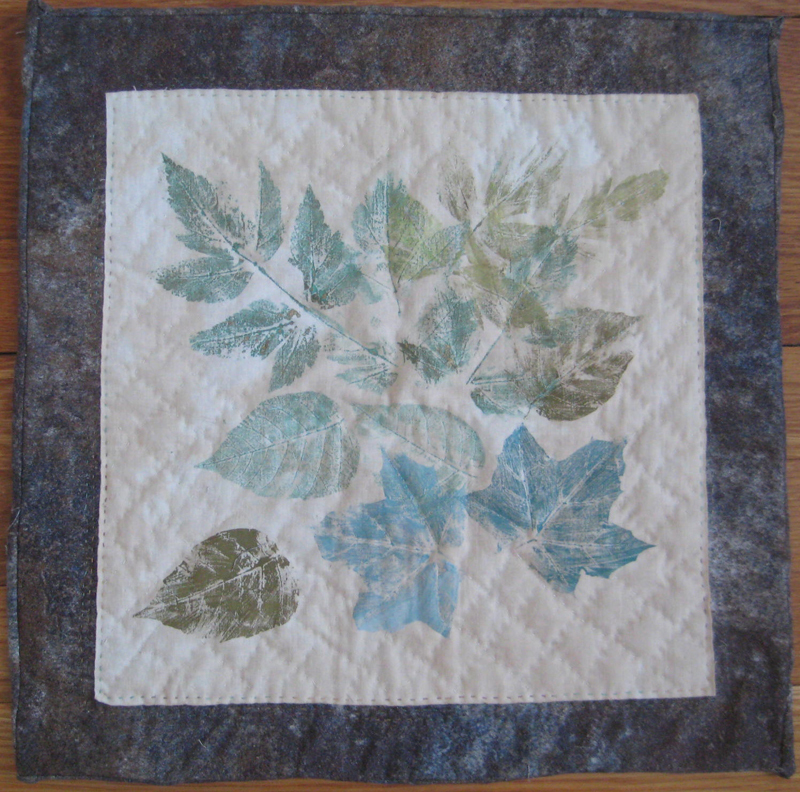 I added cross-hatch stitching around the leaves to reflect the fact that these leaves had gathered in a man-made environment. My very urban sidewalk hosted gatherings of leaves spring, summer, and fall; the image has stayed with me. Love your leaves and your wonderful stitching. Great job! There is a great calm in this piece.